Developing a more accessible, small-displacement (250cc to 500cc) motorcycle for Asia emerging marke ts through a planned strategic alliance with a manufacturer in Asia. This new product and broader distribution is intended to fuel Harley-Davidson’s customer access and growth in India, one of the largest, fastest growing markets in the world, and other Asia markets. Harley-Davidson’s first Adventure Touring model is expected to hit the market in 2020. Harley-Davidson’s electric motorcycle, the LiveWire, is expected to hit the market in 2019. 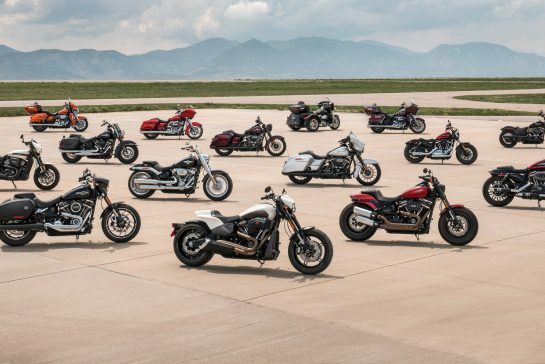 It will be the first model to feature a wide range of electrically driven “Twist and Go” two-wheelers without a clutch, with which Harley-Davidson plans to take the lead in the electrification of the two-wheeler market. Harley-Davidson has planned a wider range of lightweight, handy electric models that designed for the urban environment and the fun of freedom for a new target group to convey two wheels. The market launch is scheduled for 2022. The pictures are prototypes. The standard model may differ in details from the vehicle shown and is not yet commercially available. Illustrated future models may not be available in all markets.